The cold weather is coming. And almost nothing tastes more warming than lamb. 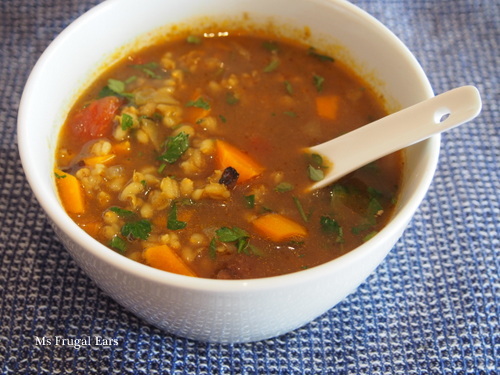 Except perhaps eating it in this barley stew. Lamb is not exactly a frugal food. Not even in Australia where it was once a staple. But the good thing is that a little of it goes a long way in this dish, where I stretch it out. It tastes full-bodied, though, and you would not really guess that the dish is so frugal. Well maybe you would if you were dining at my place on a Friday but otherwise you might not realise. This is a bit of a cross between a stew and a soup. I like it a bit thicker, but add less barley if you would like more of a soupy texture. Cut the fat away from the lamb chops and reserve. Cut the remaining two lamb chops into small pieces. Reserve the bones. In a large, heavy-bottomed saucepan (e.g. 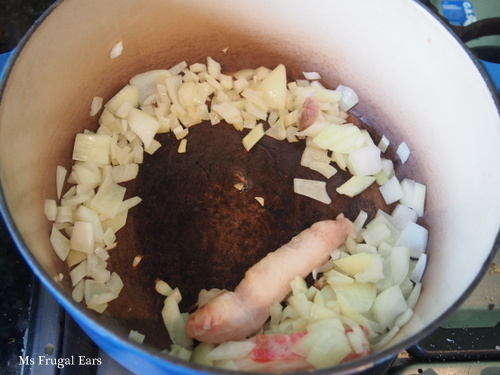 a cast iron one) fry the onion with the lamb fat until the onion is translucent. Remove the fat and discard. Add the lamb (including the bones), and fry until it is just cook. Then add the barley, tomato, cumin and coriander, and fry for a further minute or two. It should be very fragrant at this point. Pour over the two litres of water, and bring to the boil. Add in the remaining ingredients. 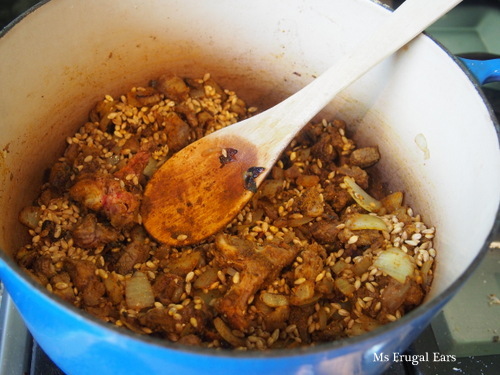 Cook for around an hour or until the barley and meat are tender. Serve in bowls with bread and lots of parsley. My daughter and husband loves lamb and this stew looks hearty and delicious, will give it a try. 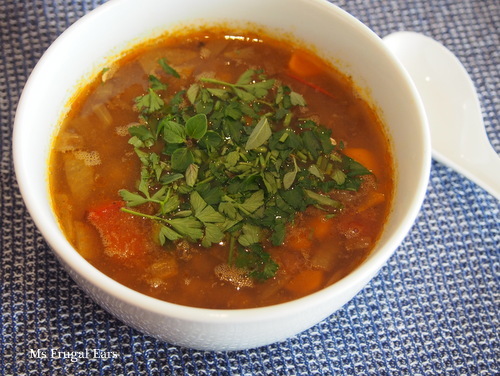 This is the perfect dish for me as it has proteins, good fiber without costing a fortune! I have bookmarked it, lamb is relatively cheaper in India (well not compared to chicken, but still quite cheap) so I will definitely try it! And the secret ingredient is . . . vegemite! I wonder if anyone would guess it was in there if you didn’t tell them. A very Australian meal with the lamb as well. I love using lamb for stews or casseroles etc, this looks good. I love everything about this recipe, except the lamb. I grew up on a farm in central NSW and we ate lamb almost every meal for around 15 years, it is now one of those tastes I just cannot handle, but easy fix, I just substitute the protein with something different. Loving your secret ingredient, I use anchovies for that salty hit!